Dig into our revamped and expanded website! It’s bigger and better than ever, and brimming with all you need to get into organic gardening. ABC Organic Gardener magazine has long been Australia’s trusted guide to growing your own food and now our online audience can share in the wealth of knowledge from some of our most respected and experienced gardeners, including regular OG contributors Peter Cundall, Penny Woodward and Jerry Coleby-Williams. 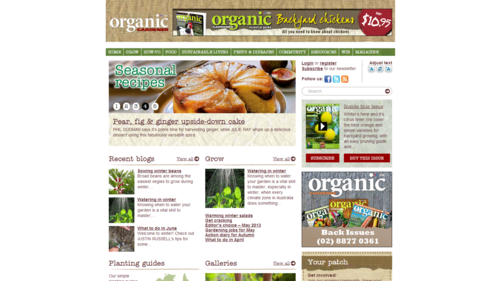 The new-look website includes a mass of articles from the magazine as well as exclusive online content along with stunning photography, practical how-to video, news and organic resources – everything an organic gardener needs. Want to know what to plant now or how to make your own compost? Head to the OG website. Maybe you need some expert tips on ridding your vegie patch of unwanted pests and diseases naturally, or how best to harvest your latest crop? You’ll find it all on our website – along with delicious and easy recipes to make the most of your homegrown bounty. And there’s the chance for you to get involved too! One of the many new highlights is the ‘Community’ section, which allows you to post your own stories and photos about your garden and share them with other OG readers. We also have a new section on ‘Sustainable Living’ where you can find inspiring stories and practical information on becoming more self-sufficient – from having your own chooks to going solar. Plus there’s our regular bloggers – Simon Webster, Justin Russell and Phil Dudman – who already have a staunch following, as well as information on subscribing, regular competitions and how to sign up for our e-newsletter. Head to the new OG website now and see for yourself. We’d love to hear your feedback via email at organicgardener@your.abc.net.au or facebook.